I checked the flows, and most rivers were high and muddy with snow melt. The only real option near Denver was the South Platte River in the Deckers area, which was actually running relatively low at 52 CFS. I went for a run and took my time before arriving at the stream at around 11AM. I turned right at the bottom of Nighthawk hill and headed to the parking area near some very large boulders personally named Whale Rock. 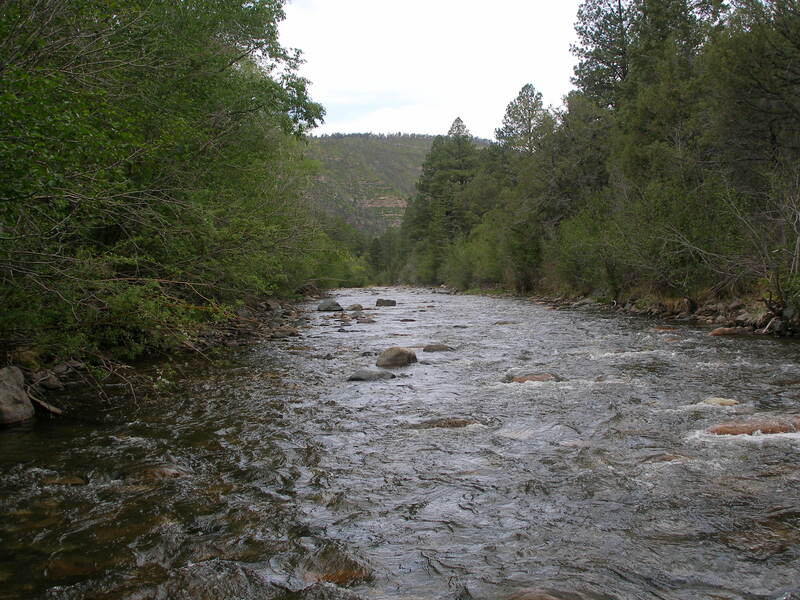 I knew there was some nice pocket and riffle water near this lot that does not typically receive much pressure. 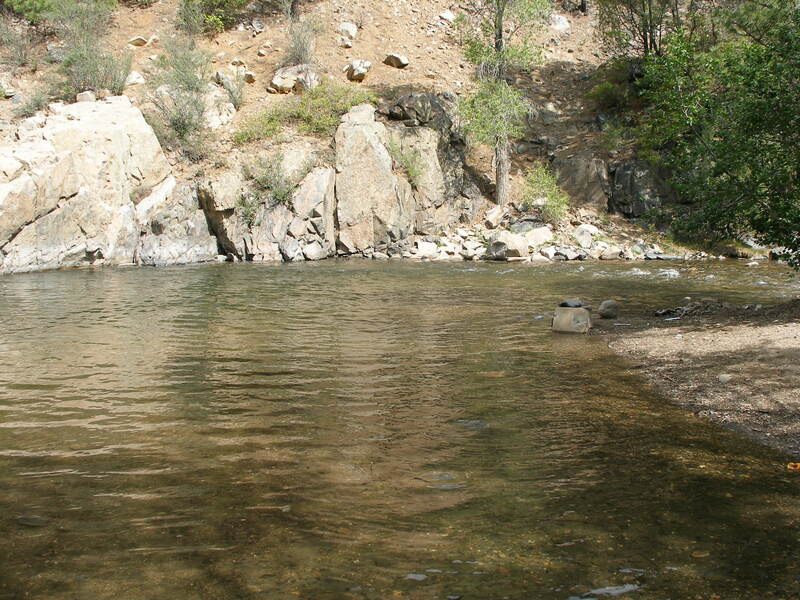 I had no information regarding fish density since the Heyman Fire, but this was an area I enjoyed in the pre-fire era. I ate lunch first, and then hiked along the dirt road and cut down the steep bank, crossed to the other side and continued until I reached the white water drop off. There was a very nice deep pool just before the major spill over. I put a yellow Letort hopper on top with a beadhead pheasant tail below. The two fly combination generated flashes to the hopper but no take, and eventually I shifted my position, until I was directly downstream, where I could obtain better drifts and cover the water more effectively. With this shift in approach I began to catch fish. 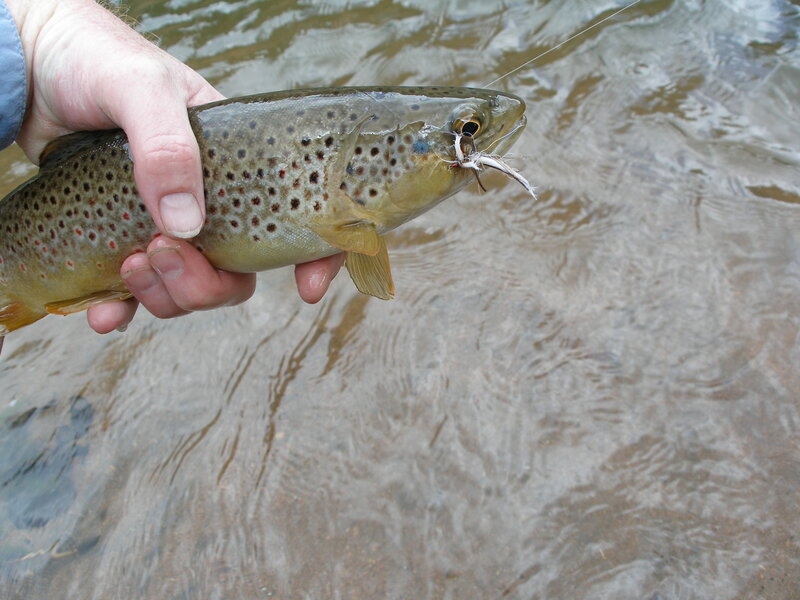 I caught 5 trout from the first pool; one or two on the hopper and the rest on the beadhead pheasant tail. 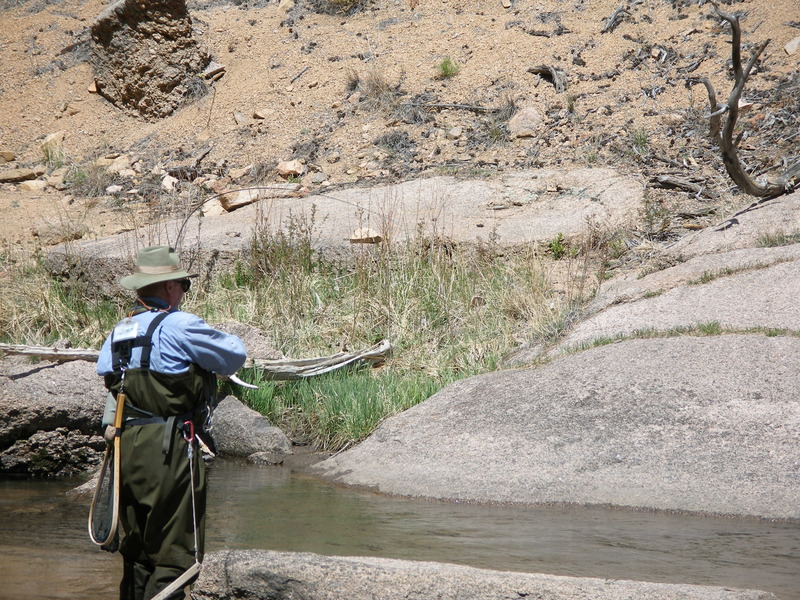 Eventually I moved on and began prospecting with the combination in likely locations. I noticed a bunch of caddis flitting about, and the beadhead pheasant tail was not producing to my liking, so I tied on a beadhead bright green caddis pupa. This was the ticket. I caught nearly all my fish on this fly. Toward the end of the day it began to unravel. I had amazing luck in very shallow shelf lies where the water fanned out toward the bank. The river was very low compared to normal, but the fish did not seem to be exceptionally skittish. Around 3PM as I worked my way to near the parking area, I began to spy yellowish mayflies floating above the water accompanied by sporadic rises. A pair of fishermen above me departed just as the hatch commenced. They left me two beautiful runs going into pools with rising fish. I was about to call it a day at twenty fish, but when I saw the mayflies, I absorbed a boost of interest. I nipped off the hopper and caddis pupa and tied on a size 16 PMD comparadun. This was a winner, and I experienced great fun over the next hour taking trout on the surface. After I rounded the bend, I caught one or two, but refusals became more prevalent, so at this point I called it a day. Amy and Dan dropped me off at the Dalton day use parking lot along the Pecos River, around 45 minutes east of Santa Fe, NM. 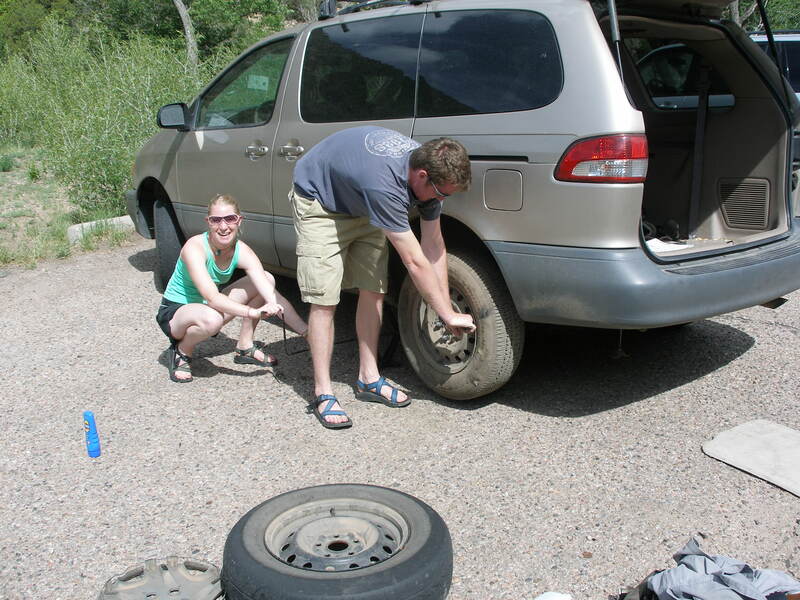 While I was gearing up to fish, Amy and Dan threw the Frisbee, and then they noticed we had a flat tire on the left rear tire. Dan changed the tire, and luckily it was a regular spare and not the temporary type since we faced a six hour drive back to Denver. 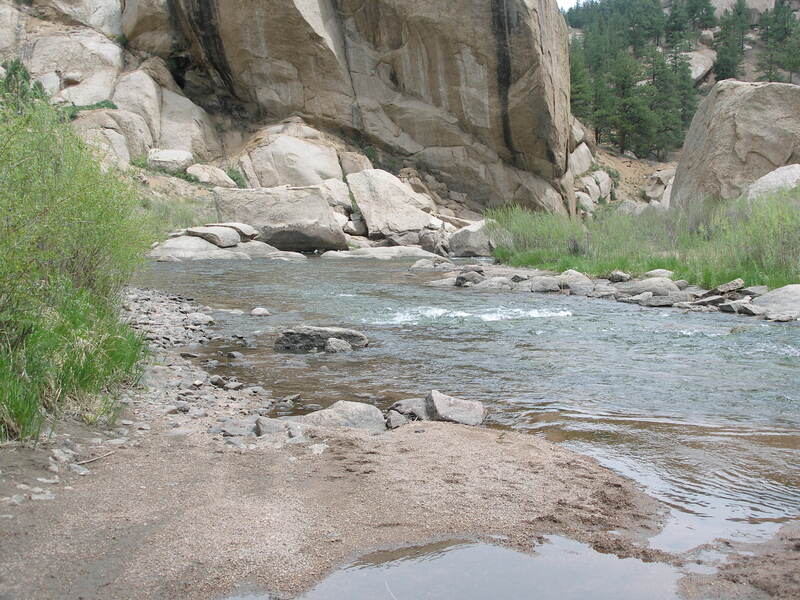 Once I knew the kids were OK, I began fishing upriver while they returned to Santa Fe to complete some loose ends on Amy’s move, and following that they went mountain bike riding. 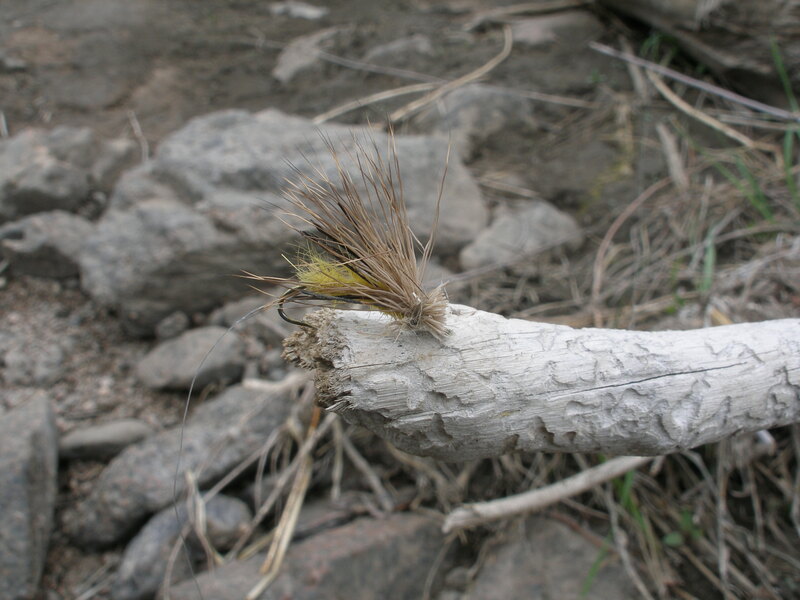 I began at a beautiful bend pool and rigged up with a yellow Letort hopper and beadhead pheasant tail nymph on a dropper two feet below. I cast to the slack water in the arm pit of the bend with my first cast, but nothing took it. On the second cast I shot it closer to the faster run going into the pool, and a small brown rose and inhaled the hopper. I took a photo, released, dried the hopper and cast a foot closer to the run, and after a two foot drift, a larger brown sucked in the hopper. I repeated the routine, and my fourth cast went up farther and into the faster run, where another brown rose and took the hopper. At this point, I was convinced that I had some great fishing ahead of me. As it turned out, I did, but not quite this ridiculously easy. I noticed quite a few black stoneflies lumbering about, and occasionally I spotted some other stoneflies that were not quite as large as the black versions. 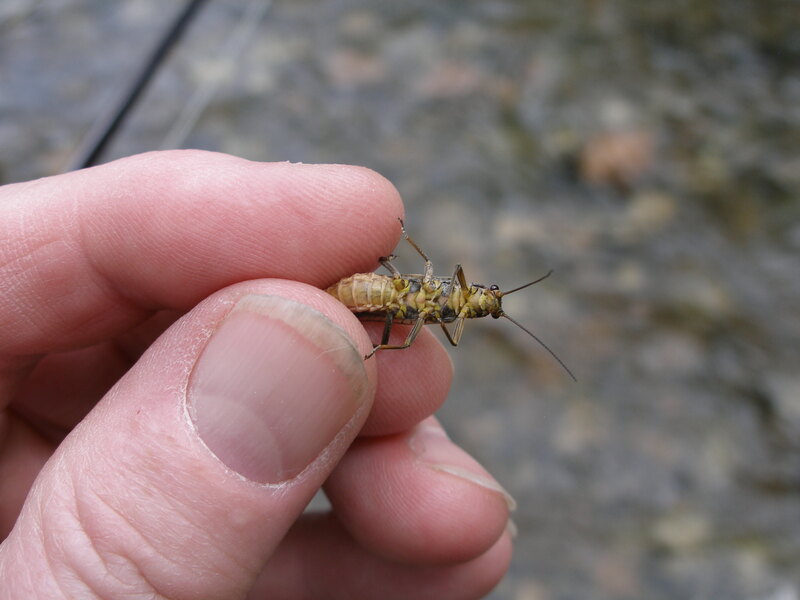 I later discovered the others were golden stoneflies, when I caught and photographed one. Apparently the fish were rising to the yellow Letort hopper as a golden stonefly imitation. 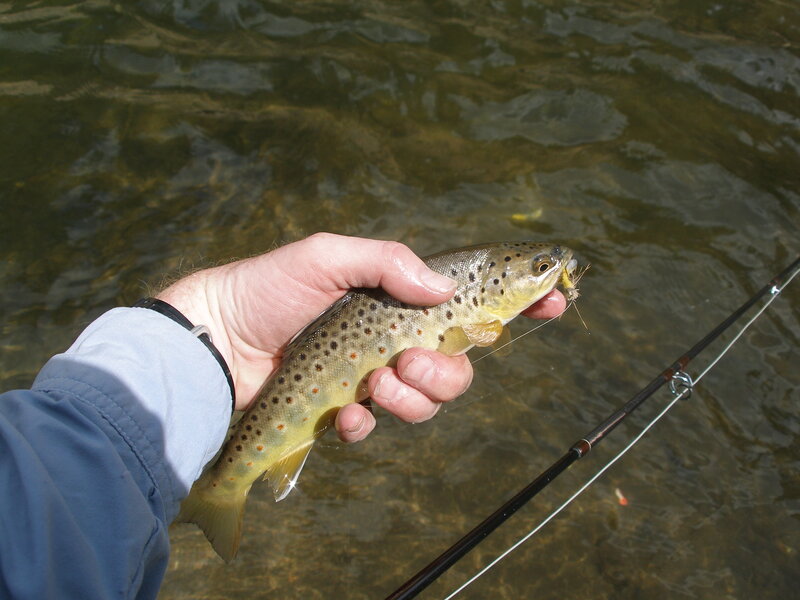 I caught another small brown on the trailing BHPT in one of the eddies on the far side of the run that yielded three, and then I moved upstream. There was a nice pool where the stream flowed out from under the bridge by the road, but a fisherman was on top of the embankment fishing down into the pool with a spinning rod, so I climbed the bank and went across the highway. I began working the dry/dropper combination methodically and covered the water through a nice pool and run. I received some refusals on the hopper. When I turned the bend, I encountered a couple more fishermen, and there was a fisheman access parking lot on the left. I exited the stream and hiked a worn path above the fishermen and then jumped back down to some shallower water with riffles. As it turned out, these types of stretches were not very productive, because the water was so low and clear, thus providing minimal cover. 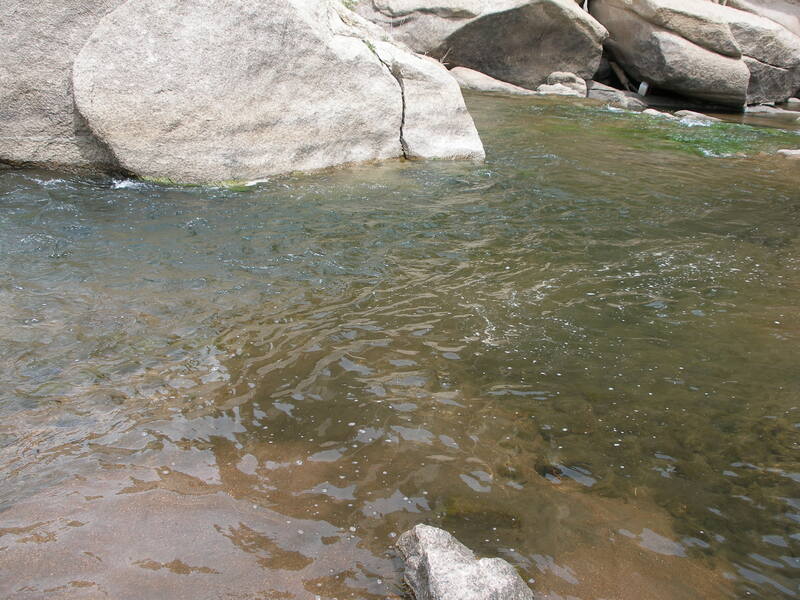 I came to a nice deeper pool where the current swept along a large rock on the far side. I made quite a few drifts to no avail, and was about to move on, when the hopper paused, and I hooked up on the only rainbow of the day on the BHPT. I encountered a couple of bait dunkers at the next hole and again circled above. It was around this time that I caught the golden stonefly and photographed it. I also was not getting much action on the BHPT, so I swapped it out for a beadhead hares ear. 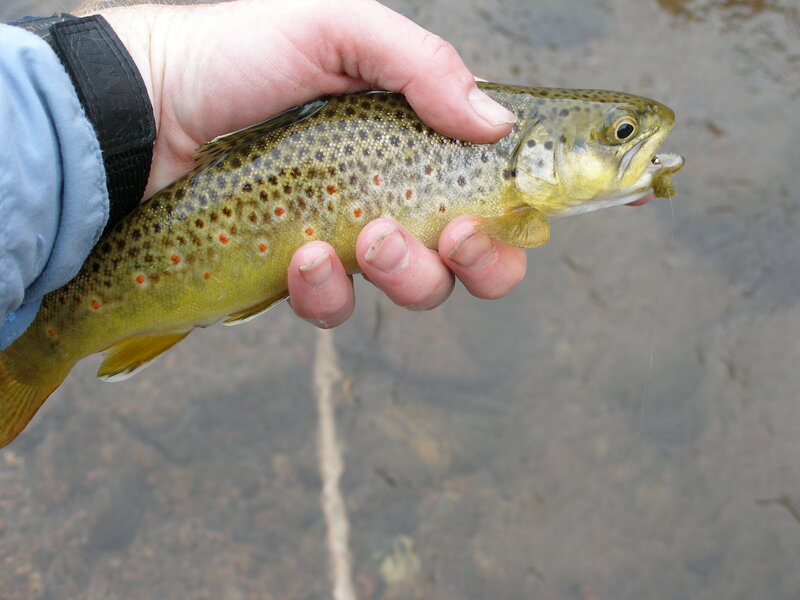 During the remainder of the morning, I worked the water fishing all the likely holding spots and picked up numerous browns. There was one stretch that I photographed with deeper pockets that produced quite well on the BHHE. I stopped fishing around 12:45 so I could hike back down the road to meet Dan for the return trip. When I arrived at the parking lot, Dan was not there yet, so I tried a nice wide run across from the parking area. I flipped backhand casts to the top of the run, and noticed a pause on the hopper on the tenth cast, and landed a final brown, which I photographed in some cool fern-like vegetation on the bank. Dan did not arrive until around 1:30, at which time I changed clothes, tossed everything in the van, and we were off on the return trip to Denver. With a beautiful spring day forecast; Amy, Jane and I hiked into Cheesman Canyon to enjoy the outdoors. 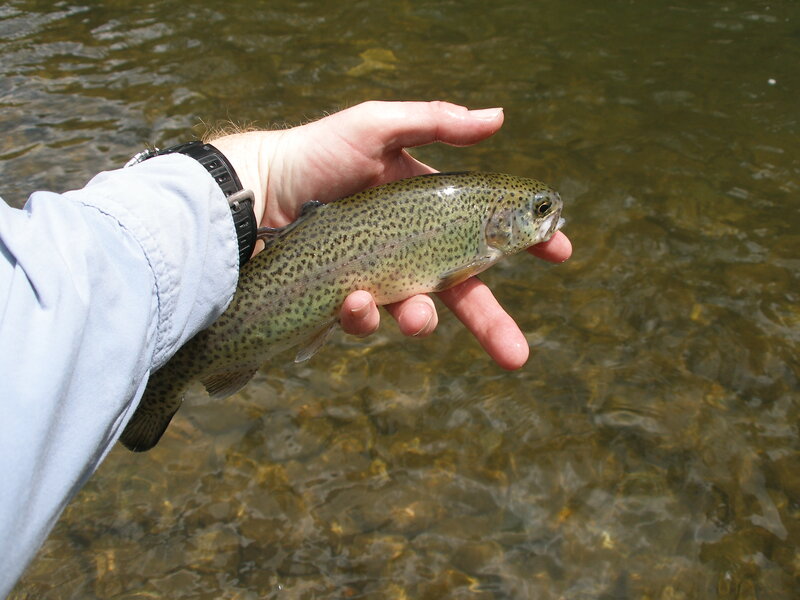 I enjoyed a few hours of fishing and caught three beautiful trout. This may be our favorite Colorado location.